Spending in the campaign for state superintendent of public instruction in California is expected to break records once again this fall, as charter school advocates and labor organizations focus on the race. 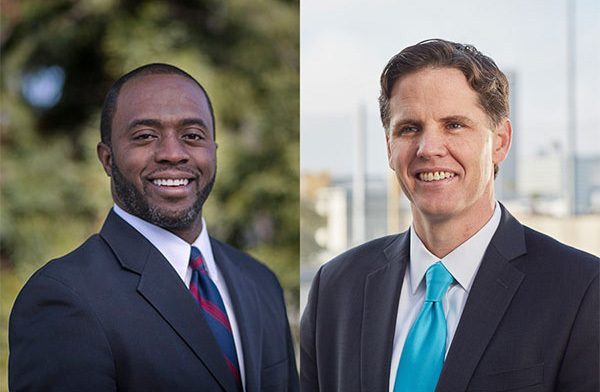 Although the Nov. 6 ballot will include races for governor and U.S. Senate, it is the nonpartisan contest between Democrats — Assemblyman Tony Thurmond, D-Richmond and Marshall Tuck, a former charter school executive — for an office with limited power that is expected to attract the most money during the general election. With seven weeks to go before Election Day, fundraising for Tuck has already surpassed what his supporters raised in the former school administrator’s unsuccessful run for superintendent four years ago. “This is going to be the most expensive election, period,” said Sherry Bebitch Jeffe, a professor at the University of Southern California’s Sol Price School of Public Policy. Thurmond is a former social worker, school board member and council member in Richmond. Tuck is the former president of Green Dot Public Schools, a charter school organization based in Los Angeles, and CEO of the Partnership for Los Angeles Schools, a district-city initiative that runs 18 district schools. Tuck will benefit from $10.8 million raised by an independent expenditure committee backing him as of Monday, compared to $4.9 million raised by an independent committee supporting Thurmond. In addition, Tuck raised $3.1 million in direct contributions to his campaign through June 30, the most recent reporting deadline, outpacing Thurmond’s $2.1 million in direct contributions. In Tuck’s unsuccessful 2014 campaign to unseat State Superintendent of Public Instruction Tom Torlakson. he raised $2.6 million in direct contributions, while an independent committee supporting him raised $10.4 million. Independent expenditure committees have no limits on what they can collect and spend but they are barred from coordinating their efforts with the candidate. In contrast, individuals and political action committees are limited to a maximum contribution of $7,300 each for the primary and general election in direct contributions to campaigns. The 2014 state superintendent for public instruction campaign was the most expensive race on that year’s ballot. Spending by the candidates’ campaigns and independent committees backing Tuck and Torlakson amounted to a combined $22.6 million, dwarfing the $13.3 million spent in the governor’s race as Jerry Brown cruised to a fourth term. Wealthy donors pushing to expand charter schools in California have driven much of the spending to support Tuck so far by pouring large donations into the Sacramento political advocacy organization EdVoice For The Kids PAC, which runs the committee backing Tuck. Although EdVoice has donated to dozens of candidates over the past two years, nearly 90 percent of the money it gave as of the most recent reporting date went to its Tuck committee, which calls itself Students, Parents and Teachers supporting Marshall Tuck for Superintendent of Public Instruction 2018, a project of EdVoice. EdVoice officials did not respond to an interview request. Contributors to EdVoice include venture capitalist Arthur Rock, who gave $3 million, real estate developer Bill Bloomfield who gave $2.9 million and philanthropist Eli Broad who gave $1.3 million. Kevin Gordon, a political observer who leads Capitol Advisors, an education consulting firm, said the 2018 contest is attracting money from education-minded donors this year because there is no real contest in the governor’s race between Democrat front-runner Gavin Newsom and Republican John Cox. A committee backing former Los Angeles Mayor Antonio Villaraigosa’s campaign in the gubernatorial primary attracted multi-million-dollar donations from some of the same advocates of charter school expansion who support Tuck. Labor groups, including the state’s teachers unions, backed Newsom. But Villaraigosa’s third-place finish in the June 5 primary behind Newsom and Cox set the stage for a gubernatorial election few expect to be competitive in deep-blue California. Polls have shown Newsom with a commanding lead in the race. California Teachers Association President Eric Heins told EdSource that the union’s two top priorities in 2018 were the race for governor and state superintendent. The union has given just over $3.2 million to the committee backing Thurmond, including a $1 million donation on Wednesday, making it the largest donor to the committee, known as Educators Supporting Tony Thurmond For Superintendent Of Public Instruction 2018, Sponsored by Teachers and School Employee Organizations. Other contributing groups to the committee include the California Federation of Teachers and California Faculty Association. “It’s about making sure people know … who the candidate is teachers support and why,” Heins said. He declined to say how much more the teachers union is prepared to spend on the race, or how that money will be spent. Tuck and Thurmond have agreed on some of the biggest issues in California education, saying the state should raise commercial and industrial property taxes to fund dramatic increases in education spending and do more to raise the performance of black and Latino students. Neither candidate can be simply characterized as “pro-charter” or “anti-charter.” Each has said there is a role for effective charter schools in public education and that the schools need greater transparency and oversight. They both support a ban on for-profit charter schools that was recently signed into law. But Tuck and Thurmond have differed over how to handle the growth of California’s charter schools, which in some areas have attracted students and state funding from traditional school districts. Thurmond has hinted he could support a moratorium on new charter schools. Tuck opposes that idea and has instead called for the state to keep in place funding for districts affected by charter school growth for a time, so those districts can adjust to lower enrollment. Still, the battle lines of the charter debate have been drawn in the campaign. And despite Tuck and Thurmond’s agreement on many issues, Gordon said the superintendent race “will be painted in extremes” to get voters to pay attention to this contest for an office far less prominent or easily understood than that of governor or senator. “Expect a pretty brutal campaign that makes Marshall Tuck look like the wholly owned subsidiary of charter school interests and Tony Thurmond the wholly owned subsidiary of organized labor,” Gordon said. The primary campaign between Tuck and Thurmond was very tight, with Tuck receiving 37 percent of votes and Thurmond 35.6 percent. Because neither candidate won more than 50 percent they will face each other in a runoff election on Nov. 6. In the 2014 election, Torlakson’s margin of victory in the general election was less than 300,000 votes. Nearly one of every five voters — 1.4 million of the 7.5 million who cast ballots that November — did not cast a vote for the office. Andrew Blumenfeld, the Tuck campaign manager, said it was “misleading” to conflate independent committee donors with the larger number of people who have given small amounts directly to Tuck’s campaign. “Literally thousands of people have decided to invest themselves in the cause of improving public education,” Blumenfeld said. Rebecca Morgan — a former Bank of America executive and former Republican state senator from the South Bay — cited Tuck’s time in Los Angeles, where he led Green Dot Public Schools, a charter school network, and the Partnership for Los Angeles Schools, as one of the reasons she supports him. Morgan has contributed $500,000 to EdVoice. All of the money being spent on campaigns would be better spent on much needed services for our students. “Thousands of people” are donating money to these campaigns, meanwhile schools are paying teachers and staff who have abused students to leave their school and go work at another school because they can’t afford to fight the teacher and the union in court. The education system needs to get their priorities straight and put students safety first, without them, these campaigners wouldn’t have a job.